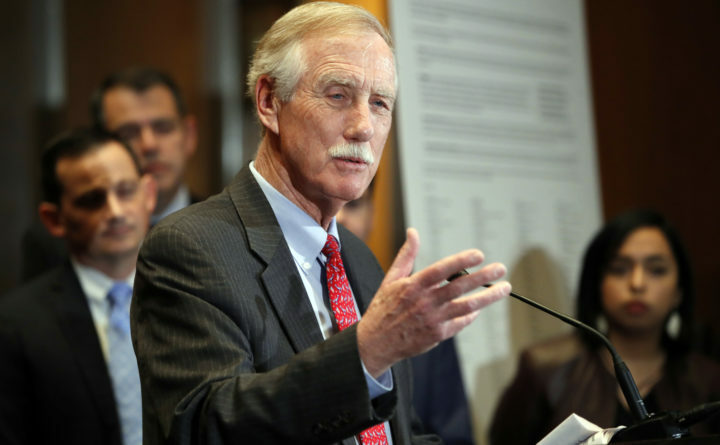 Sen. Angus King, I-Maine, speaks on Capitol Hill in Washington, Feb. 7, 2018. King on Sunday questioned the Trump administration's decision to fire former FBI Deputy Director Andrew McCabe just 48 hours before his scheduled retirement. McCabe, a 20-year bureau veteran who was set to retire with full benefits, will likely lose a significant portion of his retirement benefits as a result of his termination. McCabe claimed in a statement to The Washington Post that he was being targeted because he was a witness in Special Counsel Robert Mueller’s investigation into whether the Trump campaign colluded with Russia to interfere in the 2016 election. Rep. Mark Pocan, D-Wisconsin, announced Saturday afternoon that he has offered McCabe a job to work on election security in his office, “so that he can reach the needed length of service” to retire, according to The Washington Post. Rep. Seth Moulton, D-Massachusetts, tweeted that he’d consider hiring McCabe, too. With those 20 years, he would need to just go to work with the federal government for another day or so in any job he pleases, whether that’s as a election security analyst for a Wisconsin congressman or a typist for a day, to get full benefits, the former official told The Washington Post. The job doesn’t matter so much as the fact that he’s working within the federal government with the same retirement benefits until or after his 50th birthday. President Donald Trump has frequently been a vocal critic of McCabe, suggesting he was biased in support of Hillary Clinton. Trump also has vented about McCabe’s wife who ran as a Democrat for a seat in the Virginia Legislature and received donations from a political action committee run by a close Clinton ally. Trump reportedly asked McCabe during an Oval Office meeting last May who he voted for in the presidential election, according to The Washington Post. King questioned the timing of McCabe’s dismissal before the inspector general’s report about his conduct was made public and whether the Trump administration pressured the Justice Department to take action against him. Trump took aim at McCabe on Sunday after The Washington Post reported he kept memos detailing his encounters with the president, much like his former boss James Comey did. “Spent very little time with Andrew McCabe, but he never took notes when he was with me. I don’t believe he made memos except to help his own agenda, probably at a later date. Same with lying James Comey. Can we call them Fake Memos?” Trump tweeted Sunday morning. King, who sits on the Senate Intelligence Committee, which is overseeing its own investigation into Russian meddling, said it would be a “huge mistake” for Trump to fire Mueller, whose investigation has already netted more than a dozen indictments and three guilty pleas from former Trump associates. “The president keeps saying there’s no story here, they didn’t do anything wrong. If they didn’t do anything wrong, why are they going to such extreme lengths to undermine this investigation,” he said.